Now that Christmas is well and truly over my thoughts are turning to Valentine's Day crafting, and I'm surrounded by pink and red sparkly things and embellishments! 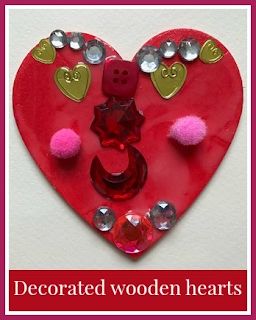 I have lots of crafty ideas to share, and I'm starting off with these simple decorated wooden hearts. 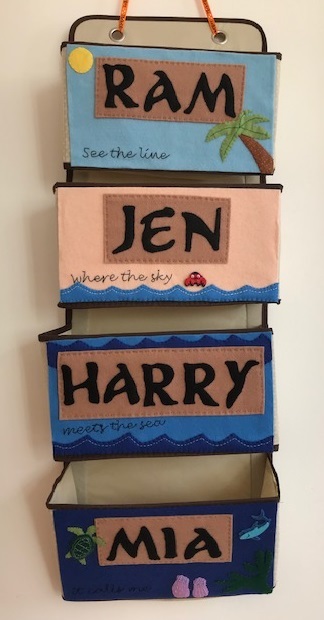 They have a magnet on the back so they can be used to decorate the fridge or radiator, and they also make a lovely little gift for a child to send to his or her Valentine. To make these hearts I used some blank wooden heart magnets from Baker Ross which I received as a Baker Ross blogger a few years ago. You can also find similar blank wooden hearts to decorate in many places online, which you could easily stick a magnet to. First I painted the hearts red. You can use acrylic paint for a nice finish, or else just a couple of coats of children's poster paints works well. Then we spread the hearts liberally with PVA glue and stuck on a variety of embellishments - jewels, sequins, pom poms, buttons and so on. Both Mia and Harry decided that they wanted to make a face, and I went with a pattern. Mia wanted to keep hers but Harry has decided to give his decorated heart to his sweetheart. He also used some Posca pens to write a little message to her on the back, I hope that she likes it!